Cauliflower, you sure do look better on that plate than you did in my fridge earlier. Poor thing sat untouched for…let’s just say many, many days. It was starting to look quite sad and droopy. Finally I had enough time to stop and breathe for a minute today to make this recipe. I’ll tell you, most days the last thing I want to do is come home from cooking for my clients to cook for myself and clean up the mess again. Especially if it entails making something for the blog because, it’s one thing to cook spontaneously and in the moment for oneself and quite another to cook carefully and methodically, taking notes and photos throughout, for this. I love everything, the food and the writing with my entire heart and soul but I gots to take a break sometimes, ya feel me? This recipe was sort of born from one of my dad’s creations from back in the day. He used to fry up cauliflower, coated in flour, and then we’d eat them piping hot just like that with a dead-simple mix of ketchup and mustard. As delicious as that is, I wasn’t feeling very deep-fry-y– mostly because of the greasiness but there’s always that part of me that shies away from any procedure that involves wasting glugs of cooking oil for one thing, not to mention the clean-up afterwards. I’ll be the first to admit that I’m SO lazy when it comes to cleaning the stove after cooking. I’ll get in my moods and scrub it clean every, oh, I don’t know, 3, 8 months and tell myself I’ll get better at cleaning it more often. And then my other self promptly doubles over in laughter because seriously, who am I trying to fool here? And so, I bypass the messy deep-frying for the much easier roasting. I adore cauliflower in all its forms but I think roasting it is one of my very top favorites, especially in the colder months when all you want to do is curl up and shovel food into your mouth as quickly as possible. And I certainly did that with this, inhaling all of what you see in the pictures in twosecondsflat. I tried to mimic the crunchy fry factor by making a batch of toasted breadcrumbs (a new obsession of mine by the way, it goes great on everything) and sprinkling it right over the top. The sauce I made isn’t anywhere near the one we used to mix for my dad’s cauliflower but it’s still got mustard in it so hey. I’d say this is a slightly more elegant version of my dad’s fried cauliflower, with lots of added flavors and spice. There are a few parts to this but it’s all super easy to make– trust me. Cook’s notes: There are so many potential variations on this it’s not even funny. I can totally imagine this with almonds instead of the breadcrumbs and dotted with fresh goat cheese as soon as it emerges from the oven. Chopped pistachios might also be nice with a scant scattering of liquor-infused raisins. As for the sauce, someone on Facebook mentioned a lemon-tahini, which honestly I think would be amazing and am definitely going to play around with next time. // Preheat oven to 425 degrees. 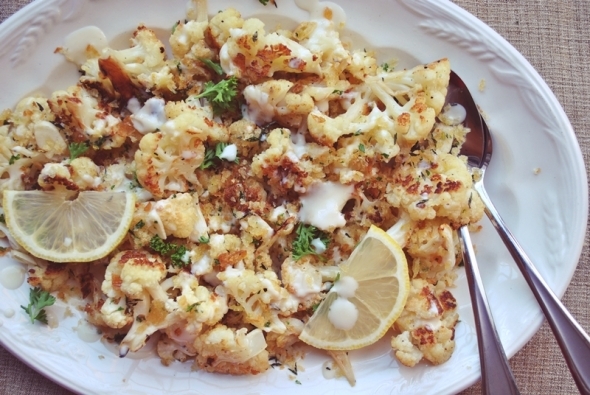 Toss cauliflower florets onto a baking sheet (separate into 2 baking sheets if you have a ton of cauliflower– you want them in a single layer and not on top of each other so they roast and not steam) and massage in a few drizzles of olive oil, the salt and the pepper. Spread them out nicely and then throw in the oven to roast for 15 minutes. After that, take them out to flip and toss around and put back in the oven for another 10 minutes. After that, add in the garlic, just putting them on top of the cauliflower and not on the baking sheet so they won’t burn, and cook for another 5 minutes. Take out and set aside. While the cauliflower bakes, make the toasted breadcrumb mixture. In a small fry pan, drizzle in the olive oil and then add the breadcrumbs, over medium heat, toss around with a spoon until they are evenly coated and nicely golden brown and crunchy, about 5 minutes. Take off the heat and add in the herbs, lemon zest, and salt, tossing again and tasting for seasoning. Set this aside. Make the yogurt sauce by whisking the yogurt with the dry mustard, honey, lemon juice, and salt. 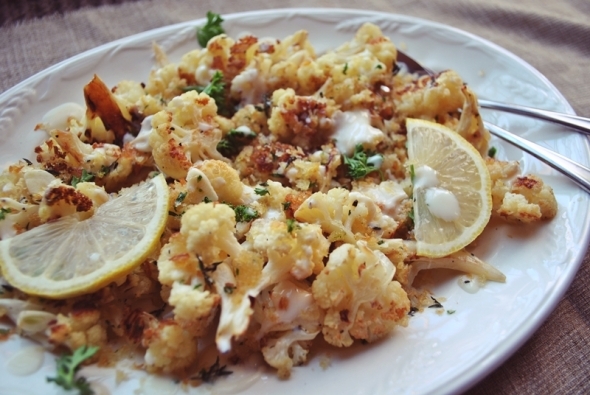 Arrange the cauliflower on a nice platter and drizzle with the yogurt sauce and top with the toasted herb breadcrumbs. Finish with another dash of freshly chopped parsley and decorate with lemon slices before serving. Enjoy! fatpiginthemarket - Good song choice for your cauliflower snack remix…hilarious video. I woke up thinking about making donuts and was just trying to decide if I was down for deep frying. I always feel weird about using all that oil once too. Toasted herb breadcrumbs for crunch are a good idea. I’ll be putting those on everything. Definitely! Island Vittles - I always let me cauliflower get to a pretty sad state before I deal with it too. Which is weird, cause it’s easily one of my favourite vegetables. This, my dear, looks delicious!